If harsh criticism from the U.S. government as the commissioner of the NBA wasn’t enough, Dennis Rodman’s North Korean “Basketball Diplomacy” has also infuriated the family of detained American missionary Kenneth Bae. Reports claim that Bae’s religious devotion and alleged requests to feed orphans may have triggered the arrest, with North Korean officials claiming to have found evidence of a coup on his computer hard drive. He was sentenced to 15 years of hard labor – a dire prospect considering that Bae suffers from diabetes, high blood pressure, an enlarged heart and liver problems. In a bizarre CNN interview on Tuesday, the eve of Rodman’s controversial exhibition match against the North Korean basketball team that he helped coach, the former Chicago Bull insinuated that Bae deserved his punishment. After being repeatedly questioned about his refusal to speak with Kim about setting Bae free, Rodman lashed out at anchor Chris Cuomo. Terri Chung, Bae’s sister, expressed outrage over the internationally televised exchange. “Dennis Rodman could do a lot of good by advocating for Kenneth to Kim Jong-un, but instead he has decided to hurl outrageous accusations at my brother, insinuating that Kenneth has done something sinister,” Chung said in a statement released to the press. 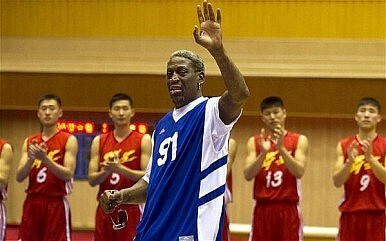 Yesterday, Rodman and a group of six other ex-NBA players faced off in a friendly match against the North Koreans – but not before singing for his “best friend” Kim. The Westerners Who Love North KoreaBacklash against Dennis Rodman on the Eve of Pyongyang Exhibition MatchNorth Korea Could Manufacture Reactor Fuel at Yongbyon Nuclear ComplexRodman Headed for Pyongyang Despite Political TurmoilAfter the Collapse With Trump in Hanoi, Will Kim Turn to Putin?